This month I’ve gone back to a wedding I photographed in June to look at some of the pictures I didn’t really rate at the time as among my favourites, in case they appealed to me. I do think that’s a useful exercise, as it’s all to easy to be drawn to certain images and skip over many of the others without thinking about their full potential. To some extent it’s just a question of numbers and trying to keep the process manageable. 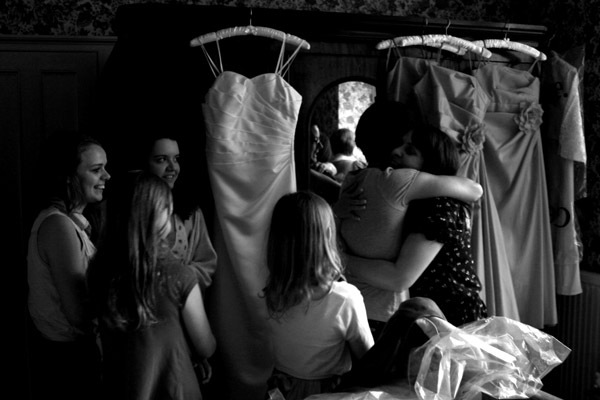 For this month’s selection I found a shot of the bridesmaids sharing a happy moment with relatives quite early on in the day and as soon as I saw it I could see the potential. A crop to remove some of the distractions in the foreground and to the right of the group (plastic bags, clothes, a rucksack), and a black and white conversion to remove the distraction of the red bridesmaids’ dresses, with a fair amount of contrast, gave me the image I was looking for. The composition of the group is tight and balanced, the mirror helps to pull the elements together. Not quite all the distractions can easily be removed, but for me the spontaneous emotions of this scene make the shot a good one – and one that is true to my style. This entry was tagged Albion days, Great Melton, Norfolk, Norwich, photojournalism, reportage, wedding, wedding photography. Bookmark the permalink.